A brief introduction to my current life, as sent to the professor who will be teaching my research methodologies class online. Most days I have been emailing with and meeting with folks who can tell me how Israelis and Palestinians teach about religion. I’ve become extremely familiar with the Israeli bus system, and have visited interviewees all around Jerusalem and also in the Israeli cities of Ramle and Ra’anana. (Every time I say Ra’anana I have to remind myself that it would be culturally inappropriate to break out into the Sesame Street song “Manamana.”) I have become somewhat familiar with the Palestinian bus system (and thus with the Israeli checkpoint system) visiting friends and simply exploring, but have not yet visited any teachers or contacts on the PA side of things. 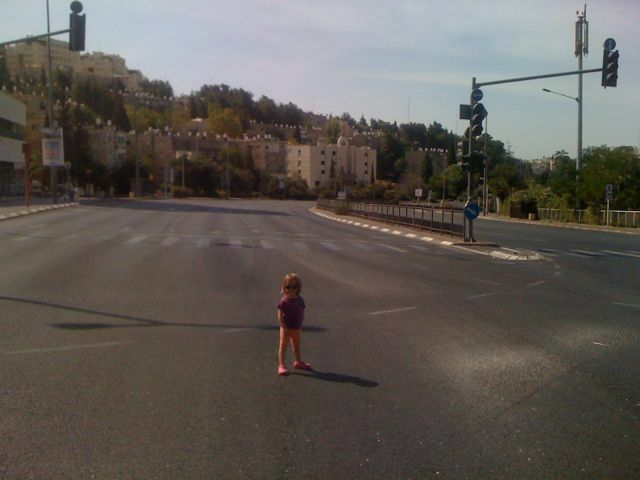 Another cool thing about this new place - no cars on Yom Kippur! My 5 year old and 3 year old daughters have adjusted to their new life beautifully. The Jerusalem American International School offers them both a wonderful learning environment and friends who speak English. It offers my wife and I expat contacts – my wife (who in real life has been a teacher, an educational researcher and run small non-profits) has already been invited onto their advisory board! Beyond the school walls, my wife is struggling with not being able to read or speak almost a word of Hebrew or Arabic. (I learned the Hebrew alphabet in grad school and have been doing some Rosetta Stone, so I’m slightly less frustrated when in Hebrew speaking areas). She is, however, reconnecting to her upbringing as a global nomad (as a young child she lived in Paris and as a preteen and teen in Britain). So far, beginning with personal and Fulbright contacts, I have spoken with a good number of fascinating non-profit directors with tangential links to religious education in Israel/Palestine. These conversations have been valuable for several reasons. Along with the readings provided me by my advisor (Zvi Bekerman of Hebrew University’s School of Education) they have given me a sense of the “lay of the land”: who designs curriculum (centralized in Israel, old Jordanian designs in PA areas), how the schools and/or religion classes divide up (into a million pieces: secular, religious, very religious, Arab, Christian, Muslim), and what Israelis generally think about their education system (Jewish Israelis – it’s ineffective and underfunded; Arab Israelis – it’s discriminatory). Of course, all of the forgoing characterizations are oversimplifications; to see a (I hope!) somewhat more subtle treatment of my interviews to date, please see my blog. Just in the past several days have I decided the time has come to strongly focus on connecting with actual current teachers. I have also asked my advisor to help me build my interview protocol. More on these moves also available on my blog. I greatly enjoyed doing an initial read through of the papers you posted under “capstone project” for last years’ folks. They have confirmed some of my anticipated and actual practices, corrected others, and primarily raised questions I look forward to discussing with you. (My biggest question is, not surprisingly, what form my capstone project should take.) Thanks for this opportunity to work with you and the support you are offering!